The name of Hendrik van Averkamp, nicknamed Nemoy from Kampen, is associated with the creation of an early Dutch urban landscape. The artist painted his paintings as if from a high point, from where the fuss of city streets was clearly visible. He was one of the first to introduce genre elements into the landscape, everyday scenes. Hendrik van Averkamp was born in Amsterdam and studied painting skills there, but the artist spent his entire life in Kampen. His favorite theme was winter landscapes. He performed his paintings according to the law of perspective, in silvery winter tones. “Winter entertainment” is a well-known and characteristic work for Avercamp’s work. Considering it, involuntarily acting as a direct observer, you feel the frosty air and with a philosophical sadness you look at how life went on in the ancient city. Other famous works: “Winter Landscape”. 1608. 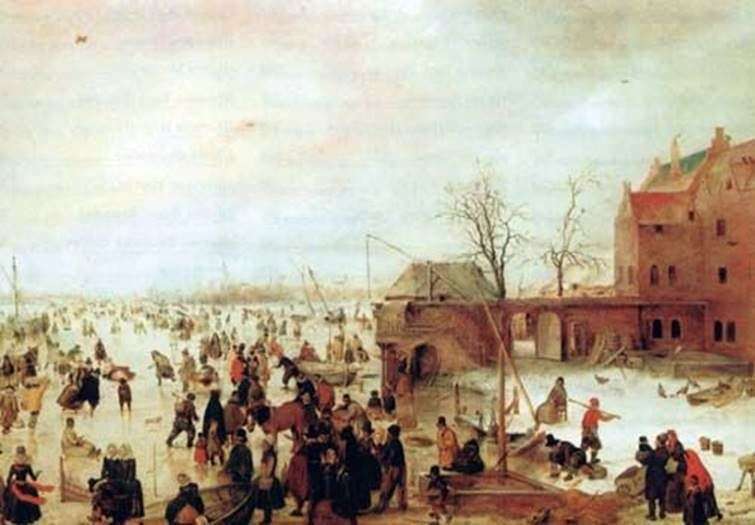 Museum, Bergen; “A large winter landscape.” Rijksmuseum, Amsterdam; “Skating”. The Pushkin Museum. A. S. Pushkin, Moscow; “Winter scene on the channel.” OK. 1615. The Art Museum, Toledo, USA. Description and meaning of the painting Winter entertainment by Hendrik Averkamp.